MCLEAN, VA--(Marketwired - Sep 26, 2016) - Qrvey announced today that it has raised a $1.2M seed round of funding led by the Center for Innovative Technology (CIT), and launched the first multi-app feedback platform for web and mobile environments. Qrvey (rhymes with "survey") will use the proceeds to further develop its innovative feedback platform, which helps businesses improve the customer experience and make more informed decisions. A simple version of Qrvey's feedback solution, featuring its survey app, has been in beta testing for several months, and has won accolades from users. "We wanted to make surveys and membership feedback an integrated part of the customer experience and we were encouraged to find Qrvey," said Barry Malek, CEO at Impexium. "Using Qrvey's API, we were able to seamlessly integrate its survey app into our Impexium membership management software in just a few hours. Now all our clients' survey data sits in our system, and we've been able to use Qrvey's analysis tools to dive into the data to look for trends and insights. It's helped us respond more quickly to our customer needs. We're excited to incorporate the new apps Qrvey is launching today." In addition to surveys, Qrvey now offers apps for instant polls, Net Promoter Score ® (NPS ®)*, trivia, and form building, giving business more ways to collect data. "Businesses already know that feedback data is essential for improving the customer experience and driving revenue, but many struggle with the mechanics," said Arman Eshraghi, founder and CEO of Qrvey. "We developed Qrvey to simplify the process, and make it an integrated part of a web or mobile experience, decreasing businesses' reliance on email surveys, where response rates are continually declining." "For our first outside investment, we sought investors with operational experience, high credibility and a long-term outlook," continued Eshraghi. "CIT fits that bill, and also has a terrific network of advisors and other entrepreneurs that we can tap into as we grow." Eshraghi was formerly the founder, CEO and CTO of Logi Analytics, a multi-million dollar private company and the highest rated vendor in embedded analytics, and founded/sold several other successful tech startups. Dan Henderson, Investment Director at CIT, who's responsible for deal sourcing at the firm, said CIT was interested in Qrvey due to founder Eshraghi's excellent track record as an entrepreneur and the company's innovative take on collecting, analyzing and leveraging feedback. "We believe Arman and his team are onto something big with Qrvey," said Henderson. "We love to see an entrepreneur who's taking a big swing at a huge market opportunity. We're excited to work with Qrvey to further the company's vision and grow its customer base." The entire purpose of collecting data is to gain insight and then take actions based on those insights, to improve operations. Qrvey makes that process easy and automated. It is the best choice for businesses that want to integrate instant feedback, such as surveys, polling or quizzes, into their web and mobile apps, and be able to quickly and easily analyze the data. Qrvey covers the complete feedback cycle: Collect, Analyze and Automate Action. Qrvey is appified: organizations can select apps that fit their needs -- examples are Quiz, Checklist, Net Promoter, Score and Instant Polling. Qrvey was designed from day one to be a platform that supports multiple apps. Qrvey is the most embeddable feedback platform, designed from the ground up to be lightweight, with an API that makes it simple to embed into web or mobile apps. Developers can even white label Qrvey modules for a seamless feedback experience. To learn more, visit www.qrvey.com. Qrvey helps businesses improve the customer experience and make more informed decisions, with the only full-cycle feedback platform covering data collection, data analysis and automating actions. Qrvey's unique multi-app platform offers many choices beyond just online surveys that can be seamlessly embedded into mobile and web environment in just a few hours. Qrvey's underlying analysis tools are designed for non-technical users, and best of all Qrvey can help businesses automate actions based on feedback. Visit www.qrvey.com or follow us @qrvey. Since 1985, CIT, a nonprofit corporation, has been the Commonwealth's primary driver in developing innovation-based economic development strategies and opportunities. CIT accelerates the next generation of technology and technology companies through commercialization, capital formation, market development and revenue generation services. To facilitate national innovation leadership and accelerate the rate of technology adoption, CIT creates partnerships between innovative technology startup companies and advanced technology consumers. Visit www.cit.org or follow us @CITorg. 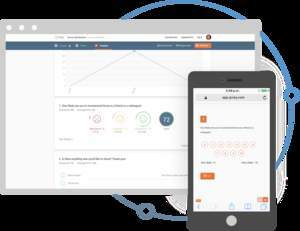 Qrvey allows businesses to embed feedback collection into their web and mobile apps -- including Net Promoter Score (NPS), quiz, poll, survey and trivia apps. The company announced Sept. 26, 2016 that it has raised $1.2M in seed funding.